Podcast From Old School to New School. This is the first episode of The Check-In: we tell you about who The Receptionist is, what we do, and why it was important to us to start a podcast. 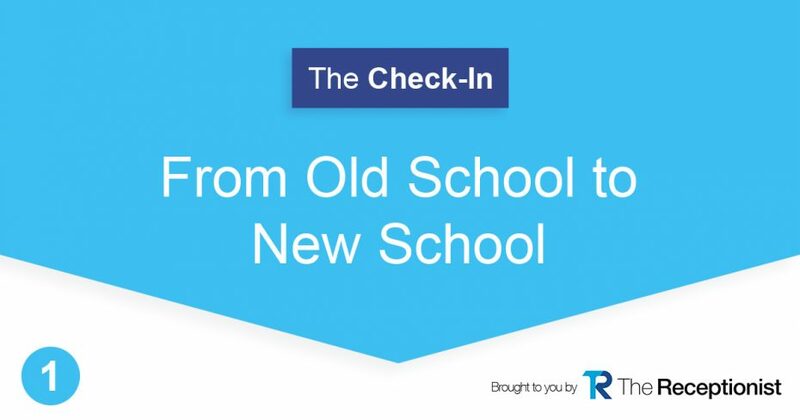 Michael Ashford, Director of Marketing at The Receptionist, joins Sara, The Check-In host, to get real about some old school office practices and why new school may be the way to go. You know we don’t want to throw shade, but there are some things offices may still be doing that are a bit old school…traditional some would say. The drawback though, is that these old school practices may lead your business to be less efficient and not as effective as it could be, and your employees and customers may not have the best experience (ick!). From the way an office is set up, to the roles people have, or the software that offices aren’t taking advantage of, old school can lead to stagnation. Who wants that?! Rethinking how your front office handles situations such checking in your guests through visitor management software is definitely new school. The Receptionist isn’t meant to replace what goes on at the front desk, but rather supplement what you’re already doing. You can still keep the warmth of a person at the front desk while getting rid of the annoying things like inefficiency and Person Nearest the Door Syndrome (sounds terrible, right?! You don’t want PND. Take a listen to see what we mean, and how to deal). We get into how visitor management software levels-up what’s happening at your front desk while increasing your offices’ safety, security, and compliance. Not only that, but there are some really great unexpected bonuses to visitor management software, like keeping your employees happy and productive because they’re less likely to experience being “hangry” (you know- hungry and angry. Seriously. The Receptionist helps with this!). Any office that wants to be a bit more new school should consider the innovations and software that’s available- creating an environment where things run more smoothly helps to relieve any friction that your employees and visitors experience. Awesome, right? We hope you feel inspired to kick it new school with us. Are You Suffering from Person Nearest the Door Syndrome?